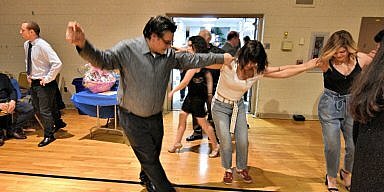 Middletown, PA – Saturday Night’s Pan-Macedonian Society dance was not like others before. On the surface, it was, of course, a celebratory affair for the generations to gather and continue to share in the customs of their forefathers. 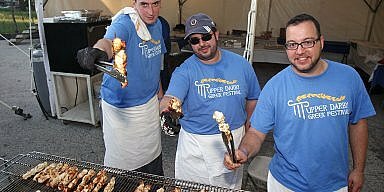 However, this event echoed the continuing reminder that Macedonia is Greece and that this community stands united behind that battle. Several speeches and commentaries as the evening started from Kiki Karamitopoulos Felfelis, Nikolaos Yiantsos, and Chris Christakis, (all leaders of the Pan-Macedonian Society of Greater Philadelphia) concluded with and emphasized the same overall message, Ζήτω η Μακεδονία! However, the message was highlighted, and the guests were sparked when two dance troupes shared the floor and performed. 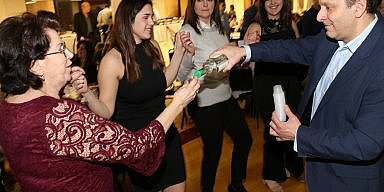 The Spirit of Macedonian Dance Troupe and Ta Kastra a dance group from Servia, Greece each put on a full half-hour series of dances from all over Greece. Ta Kastra were from the Kozani region of Greece, specifically from the town of Servia. They were flown in from Greece the evening before for the special performance. It added that special touch that brought out many. Following their series of folk dances, they united on the dance floor with the Spirit of Macedonia for several more dances before the crowd joined in. That series set the evening in motion, uniting and creating a great sense of pride. It was a symbolic evening that echoed a reminder to all for their homeland and the region, Macedonia, Greece.